Show & Martini Men Party Ideas! Having a swinging soiree' and want to jazz it up a bit beyond the usual band or DJ? 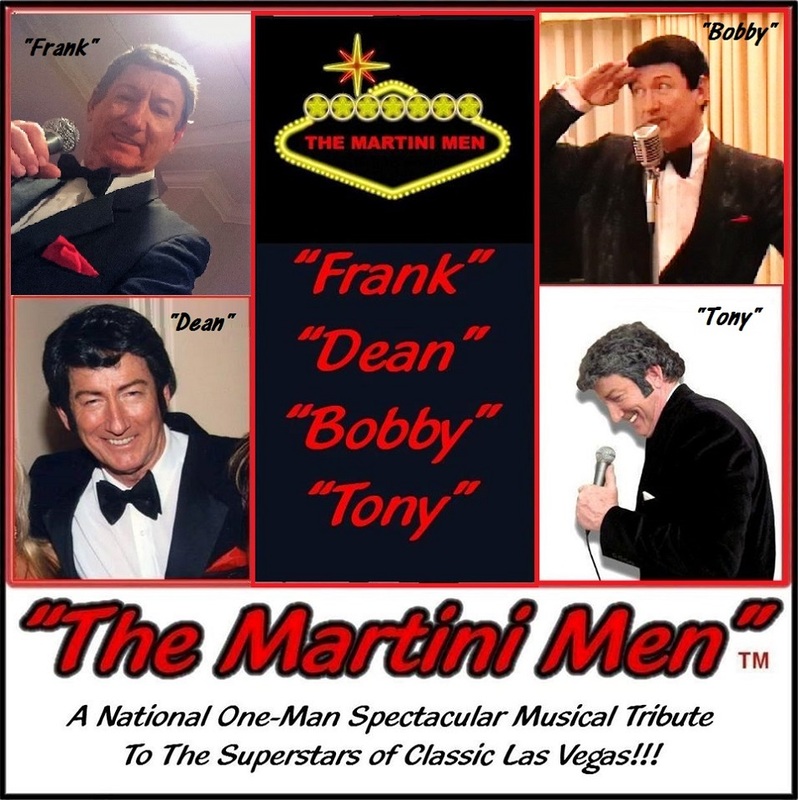 Nothing adds more fun to a "Casino Night" than an exciting live "Martini Men" show, like the legendary lounge supertars shows of classic Las Vegas! These fun fellows add superstar power to your invitations, and are grand for attracting larger attendances, which is very important for fund raisers and benefit galas. Also, even if you don't have someone setting up a full casino night, we'll bring our "Jackpot Slot Machine" and 'Wheel of Fortune" to add some fun games during the show for fun promotional prizes like fuzzy dice and venue provided goodies! Party Like It's 1959, with a "Mad Men Martini Mixer!" Here's a whole new dimension in a party theme - go retro and party like it's 1959! Yes, just like the fabulously popular TV show "Mad Men" illustrated, the mid-century modern jive and swank of New York City's Madison Avenue Advertising world was a time of glamour, great expectations and lots of hope for the future, so let's take a time warp back to laid-back cool....lookin' good, feelin' good at the begining of the space age!!! Your event will be emceed by our very own "Mad Men Don Draper" and the guests will dig the Hi-Fi sounds and the fashions! Invite your guests to dress to impress ala "Mad Men" sharkskin and "Ladies of Liesure" chic - even have a best-dressed vintage 50's-60's contest, some atomic pop culture trivia fun as well...and don't forget, that when The Martini Men are each having " meet & greet," the best in ultra-lounge bossa nova beat will be movin' their feet! "Mistletoe & Martinis" for the Holidays! Holidays entertaining is really something special when you put "Mistletoe & Martinis" together, and with this fine hot-toddy of a holiday party show, The Martini Men will add great cheer mixed with all those Christmas classics...book them as your company Christmas / New Years party and everyone will rave for the next year! "That's Amore'" - Anniversaries, Bachellorette Parties, Birthdays, Weddings, etc! Love is everywhere when you have either one, two, three or all four of The Martini Men sing for the happy couple or object of your affection! Newlywed's "first dance" will be splendid with such great crooner classics as "Dino" and his "Memories Are Made of This," or perhaps "Bobby" and his "You're The Reason I'm Living" ...and don't forget "Tony" could perform his beautiful rendition of "Because Of You," and Frank could sing his "Fly Me To The Moon." Fans of Dino, Frank, Bobby & Tony come in all ages, too, so anniversaries and birthday parties can be a real salute' with a show for the special ones! 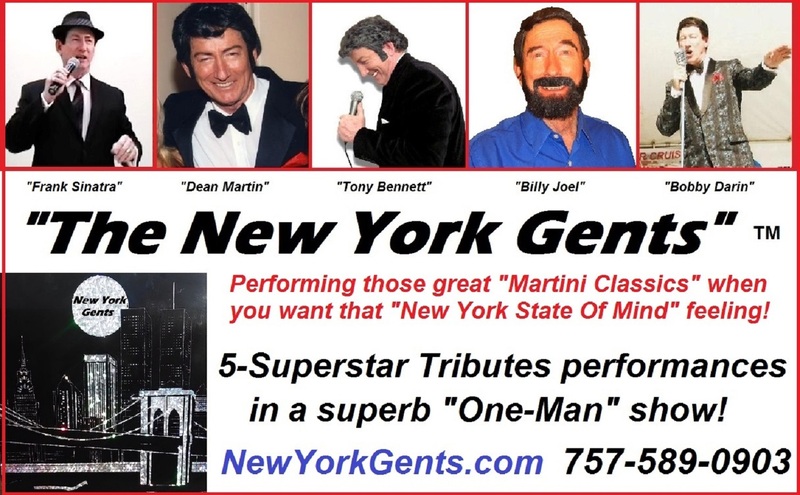 "Dino, Frank, Bobby and Tony" give a lift to any "martini mixer," too! Having a cocktail-dance party or a "booze schmooze?" These four cool cats (and don't forget "Andy Williams, Paul Anka, Rod Stewart, Neil Diamond and Tom Jones" as wild cards for their many millions of fans) add up like a four-shot of bourbon, gin, vodka and rum and you can bet your guests will be singin' along with them, shakin' what they've got and having a grand time! Also see more of our variety of shows and entertainment offerings!